They can change the look and feeling of your room with just a quick change. that I have posted on my slipcovers board on Pinterest. For me, since I am better with a hammer than with a sewing machine, it would have been much easier to just reupholster the dining room chairs. 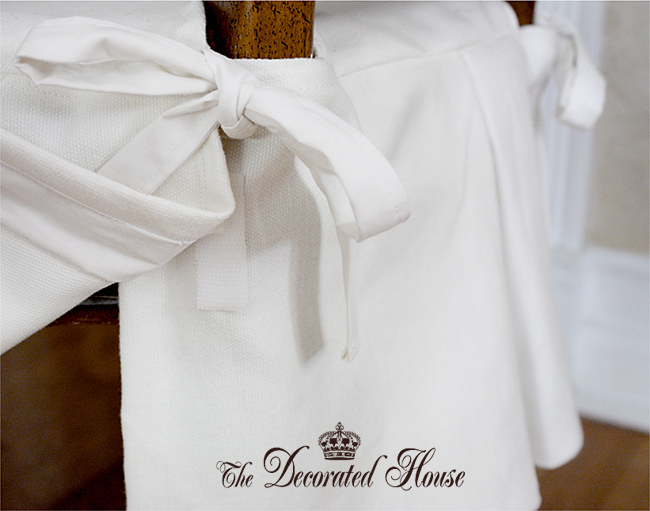 Slipcovers can actually be fairly easy to make, although if you are more skilled a sewing you ca make them more constructed. I didn't know if I would want to have the chairs with the fabric that was on them again, so I chose to do slipcovers. It is also a great idea if you are trying to keep the chairs' fabric looking good and you want an option that can be easily removed and washed. For me it was mostly that I wanted a white chair cover, which would allow them to be washed as needed. I chose heavier weight white cotton fabric. That was all I was sure of at the beginning, but I really wasn't sure exactly what I wanted them look like. 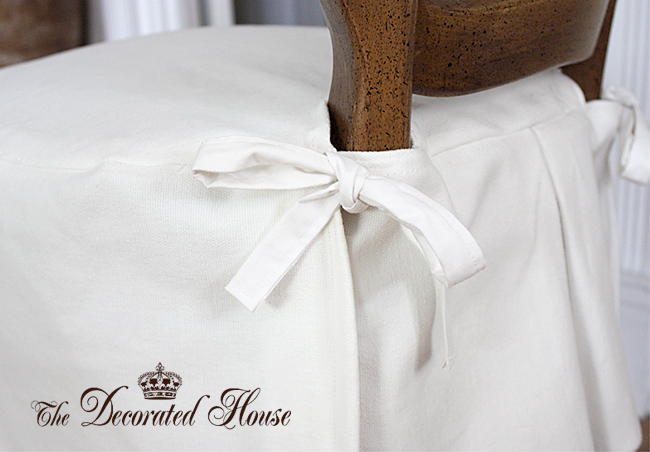 Slipcovers can be done in so many styles! They needed to be simple and for me not too fussy. But not without a little touch of details either, just no ruffles or fussy details. What I ended up doing was sewing a fitted seat slipcover with a "skirt" around the seat and then a pleat in the back for the side chairs. The end chairs got a full cover which includes the back. The white was nice and crisp, but the slip was a little too plain. So I added the ties Fortunately I made them long just in case they needed something more than a basic knot. They did indeed look better with a the touch of a bow that could just gently fall in a relaxed style. Still not too fussy, but a nice little detail. Several months ago when I first started looking for ideas and any instructions on making slipcovers for chairs to keep the wood exposed, I started a folder with a lot of great ideas on pinterest. 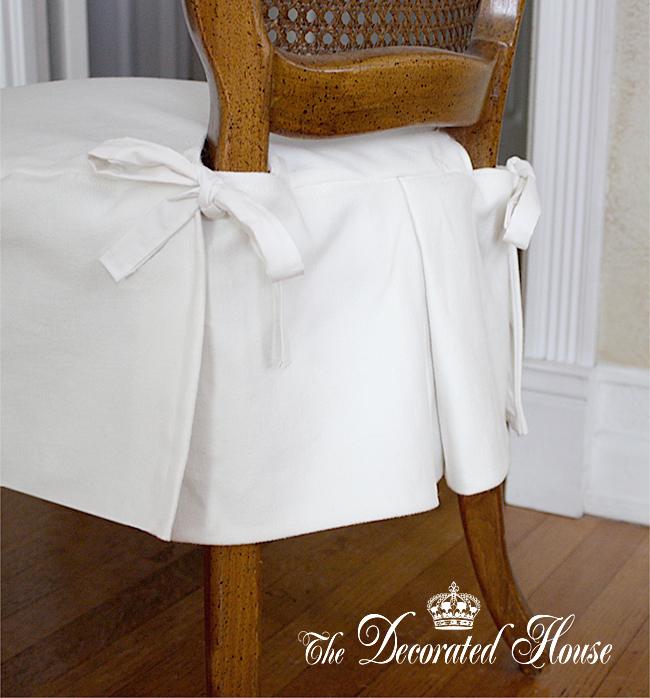 One thing I found was the great idea from Gina at Willow Decor who had some slipcovers made for her dining chairs. It always helps if you can find out how a professional does something! Her seamstress used velcro to connect the fabric around the back legs. It worked perfectly so that the fabric stays in a straight line and won't sag where the back and sides meet. In the center of the back is a pleat to add a some interest and to allow the fabric to ease around the back of the chair. Slipcovers are a great way to make a quick change to a chair, and if you use washable fabrics, they are great for easy cleaning in a dining room. If you click on the link below you can find many more ideas for slipcovers. I try to double check any pictures before pinning or re-pinning them to see that they go to the correct source. So most of the pictures should take you to the blog or site where there are ideas and sometimes tutorials. Click Picture Below For More Slipcovers. Just lovely, Donna! Love the pleat and the ties. Great idea about the velcro. I just removed my white slips for Fall/Winter, but will have to remember that velcro tip. I might add ties to mine when Spring rolls around. I've been thinking of making chair slips for our Farmhouse dining room chairs, but wasn't sure how to get around that wood piece of the arm in the back. Your photos and instructions make this sound obtainable! Thanks for the inspiration! Oh, they're just gorgeous! And they are the perfect solution to your "What if I change my mind?" and "What if Certain People get them dirty?" concerns! Very nice. I did the same thing to one of my chairs: made a slipcover for it rather than totally recovering it. 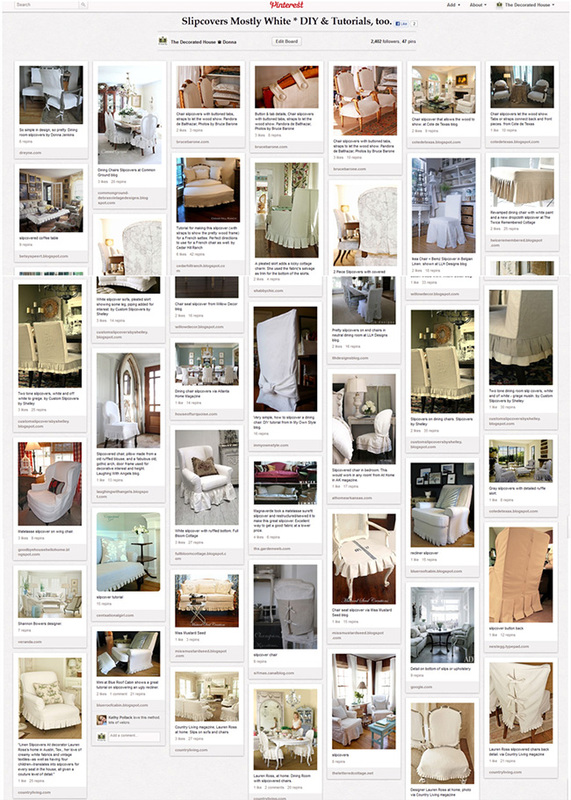 I have to thank you for posting your Pinterest slipcover board. I found a solution in one of the pins for my husband's big ol La-Z-Boy recliner that I made a slipcover for a couple of years ago and have never been happy with. Thank you for your lovely comment Elisabeth. It was so nice to meet you.